The information age, the rapid development of network technology, has brought unprecedented opportunities and challenges to our ideological and political work. President Hu Jintao pointed out: to strive to make the network become the forward position, the spread of advanced culture provide public cultural service platform, promote people's spiritual life and healthy development of the vast space. 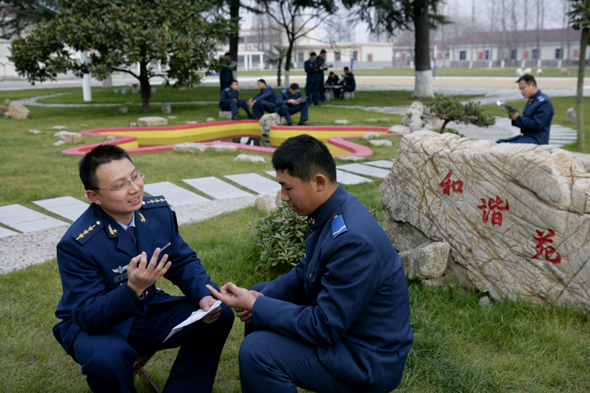 In the air, sea, authorities of the kind care and support, air force * * special installed security base firmly implement the important instructions of chairman Hu, comply with a times to tide, focus the ravine logistics force characteristics, and actively explore new ways of network education under the new situation, to achieve the "thousands of miles of Yingpan net traction, casting the soul educating heart between". Base across Jiangxi, Hubei, Henan provinces five city, under the jurisdiction of 6 positive regimental warehouse, 1 deputy regimental center and 1 at the section level cadres, covering a total area of 9266 acres. The troops are stationed in the ravine, information occlusion, many line long range is wide, small stage characteristics. From 2000 onwards, the Party committee of the base to Time will not wait for me. courage, sense of mission and responsibility, start writing network construction of this article to ideas, great determination, verve. Every beginning is hard. In a no funding, no experience, no technical support, four no staffing situation, the Party committee of the base the nettle, innovation, adhere to a high starting point plan, high investment started, multi-party financing one-time investment of 3700 Yu Wanyuan, the construction scale system covering the base made up, level two warehouse, grass-roots organs the team, the 130 main business place information network transmission, cable 246 kilometers, using the transmission cable 1720 kilometers, built a warehouse network learning room 8, Internet 9, basic soldier Internet bar 29, link the computer terminal 1668, the formation of the political work network, star network, the General Political Department of the air force blue network and base of political work net "four unity", reached the base per capita 1.5 computer, network terminal into the team into the class to the head of the bed. Based on the hardware construction, high standards and high quality in software construction. Insist to build synchronous, work combination, set up the base network construction leading group, study and formulate the "Wan use management regulations", "camp Internet construction and management regulations" and other regulations, independent research and development of 4 main systems, 19 sub system, 18 sets of information application software, to build 46 major online databases interactive electronic whiteboard, the introduction of international advanced level, the development and application of the field of satellite communication system, realize the dynamic uninterrupted transmission of image, voice, data. In the fully developed by outside the military and cyber source at the same time, built of red cultural promenade, electronic library, electronic newspapers and magazines 18 bases of political work net website, open investigation of ideas, online examination, virtual museum, psychological post, speak one's mind freely and so on 15 characteristics Webpage, embedded in the 120 kinds of learning software, storage of electronic books of more than 20 books the electronic journal, 320, upload all kinds of lesson plans, learning materials, video game, education and entertainment resources a total of more than 6000 GB, the formation of online teaching, online learning, online training, online test integration, to achieve the "between lines have everything that one expects to find, remain within doors network view of the world". Networking is the basis, net is the key. The Party committee of the base on demand network characteristics and the officers and men, according to the head of the Central Military Commission "to the network built advanced ideas spread the new position, learning to become a new platform, the spiritual culture of the new space, to guide the work of the new channel" instructions, tightly around the Xing library education, the omni-directional development network application space, creatively built five large platform. The ravine forces dispersed, limited educational resources, weak teachers, information transmission lag. Base and give full play to the network classroom, University School advantages, and actively create the open education platform. The theoretical study and political education task decomposition refinement every year, organized by above leadership, grassroots outstanding political teacher separately prepare lessons, online teaching using the interactive electronic whiteboard; every force major education, major events, the timely opening of special counseling Webpage, guide, and strong public opinion do: thousands of officers and soldiers with the class, a total of three forces resources, in the ravine woods, the voice of our party always accompany. The young men thought under the new situation of subjectivity, the independence, selectivity, diversity of growing. Give full play to the advantages of network information base mass, rich resources, and actively create autonomous learning platform. Focus on different levels, different professional soldiers knowledge demand, online learning supermarket and weekend Yucai School, the establishment of official document writing, professional counseling, skill training, lecture room and other columns, perfecting the content from natural science, history and culture, military encyclopedia, the specialized theory and the self correspondence, complete "information database", convenient for the officers and soldiers access to information, knowledge acquisition.